Two years ago when my employer adopted Extreme Programming, we began to write automated tests for our code. My memory is fuzzy at this point, but as I recall we wanted to be able to write tests and keep the source files anywhere in our source tree, and then have our test runner automagically find them, or something like that. 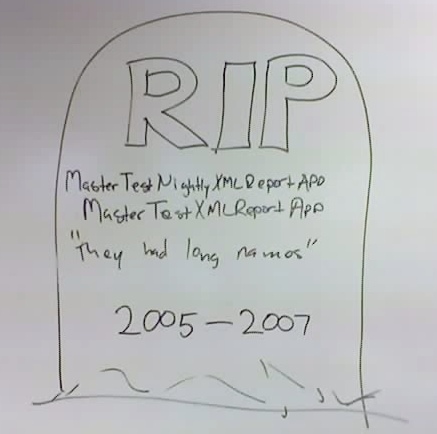 So when we created it we called it MasterTestXMLReportApp because it was cool enough to deserve such a long name. As time passed those tests got slower and slower, so we split them into two suites. One that was meant to be fast and one that was meant to be slow. The slow ones were run once a night. We called that suite MasterTestNightlyXMLReportApp because it ran every night. Fast forward to yesterday. The “nightly” tests haven’t run nightly in a long time. They just run continuously, albeit very slowly. I can never remember the name of the projects, and neither can any of my teammates. So finally we got fed up. We renamed them to FastTests and SlowTests. We held a little memorial service, and gave them a little plot on our 0.04 acres of whiteboard, complete with a headstone.